Mormon boys lead a full life of constructive activities, work, service, family interaction, education, and wholesome recreation. 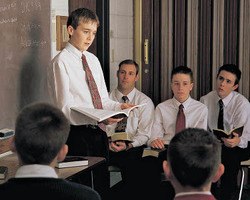 The Church of Jesus Christ of Latter-day Saints has in place many programs to help boys progress to responsible manhood. These programs address all aspects of life, and the Church sponsors Scouting Boy Scout troops to incorporate responsibility and service with sports, camping, and recreation. One of the purposes of Church programs is to help teach skills to members which will bring happiness to their lives. These include social, learning, and leadership skills and experience; the ability to develop one’s personal talents; the importance of the principle of work; service; and many, many others. The Church has strict standards of morals and conduct for all of its members. Church leaders encourage these standards to be taught in the home to children so that they might know right from wrong from a young age. The same principles are taught throughout childhood, the teenage years, and adulthood. The principles taught are the same for everyone, but focus is put on the skills which each person should develop to fulfill his or her personal sacred calling while on this earth. These standards are not meant to be limiting or debilitating; quite the opposite, in fact. It is through living the principles of the gospel of Jesus Christ that we can achieve the fullest measure of happiness. The skills which are necessary to be happy are taught in every age group. Mormon children attend a Sunday School for children called Primary from the ages of 3–11. Here they are taught, on a level they can understand, that they are children of God, who loves them very much. They are taught to recognize the promptings of the Holy Spirit, to pray to God, to learn to love the basic principles of the gospel of Jesus Christ, to choose the right, and to help those around them in love and kindness. When children turn 8 years old, they can choose to be baptized a member of The Church of Jesus Christ of Latter-day Saints. If a boy makes the decision to be baptized, he will meet with his bishop for an interview. If the bishop finds the boy worthy and prepared to make his baptismal covenants, then the boy will be baptized and confirmed a member of the Church. The baptismal covenant includes taking upon oneself the name of Jesus Christ and trying to live His commandments. After baptism, one is confirmed a member of the Church and is given the gift of the Holy Ghost by those with priesthood authority. This means that if a baptized member does his best to live the commandments of God and to repent through the power of the Atonement of Jesus Christ, he will be entitled to the guidance and companionship of the Holy Ghost, which is a very precious gift from God. After reaching age 8, boys can work on receiving their Faith in God award. The Faith in God award is intended to help boys understand their potential as sons of God and to learn to fulfill the responsibilities which that knowledge carries. It is also intended to help them have fun in developing life skills. They can work on projects together and have fun with each other while learning spiritual skills and preparing to receive the priesthood when they reach age 12. 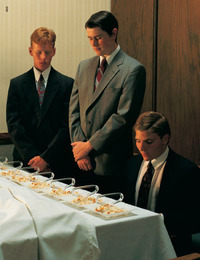 The requirements for the award include: daily prayer, regular study of the scriptures, keeping the commandments and living gospel standards, honoring one’s parents, paying tithing (one-tenth of one’s income), attending all Church meetings regularly, writing one’s testimony of the truthfulness of the gospel, memorizing the thirteen Articles of Faith, completing outlined activities in four different areas (Learning and Living the Gospel, Serving Others, Developing Talents, and Preparing for the Priesthood), and having an interview with a member of the bishopric after completing all the necessary requirements. By working on this project over a period of four years, boys can learn to have a personal relationship with their Savior and to apply the principles of the gospel in their daily lives. While in Primary, children have the opportunity to participate in many activities, sing songs, learn about God and Jesus Christ, and make friends. Once a boy turns 12, he advances to the Young Men program, which is designed for young men ages 12–18. While in this program, each young man is encouraged to participate in the Duty to God program. Like the Faith in God program, Duty to God is designed help the young men mature and develop a variety of skills by setting personal goals in four different areas: Spiritual Development; Physical Development; Educational, Personal, and Career Development; and Citizenship and Social Development. In addition to having goals in a variety of areas, goals are also accomplished in a variety of ways. A total of 7 goals should be accomplished in a family setting, 7 with a group of other young men, and 32 individually. This provides myriad possibilities for each young man so that he can personalize his award to his interests. Goals are set and met over a period of six years. The young men are separated into three age groups: 12–13 (deacon), 14–15 (teacher), and 16–18 (priest). Each young man should, in addition to the goals he meets, create and carry out one service project for each period. The Duty to God program is meant to work hand-in-hand with the Scouting program, of which the Church is a strong advocate. While the Scouting requirements help boys and young men increase many physical and social skills, the Duty to God program is focused on developing spiritual and priesthood skills, but the programs work very well together. Many accomplished goals can fulfill requirements for both programs. Here again, young men can work together and with their leaders to have fun learning new skills and spending time together in a variety of settings. Young men are encouraged to earn their Eagle Scout Award as well as the Duty to God Award. The Mutual program which the Church has set up for the youth is held weekly. 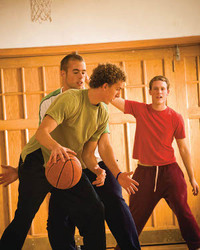 Leaders hold activities to help the young men come closer together and increase their faith. Activities may range from working on Scouting merit badges, to service projects, to sports, to playing games together, among other things. Once a month, the young men and the young women can meet together for a combined activity. Other weeks during the month they will meet separately, either with their own age groups or with the entire Young Men group. These activities bring the youth together in a social setting where they can interact with other youth who hold the same beliefs and standards they do. They can learn to apply gospel principles in their daily lives and strengthen their testimonies of Jesus Christ. The young men are such good examples for the younger boys, and they can help get them excited about programs and about the gospel. Boys are taught from a young age to respect the priesthood and to work toward receiving it. The priesthood power is the authority to act in God’s name, and is available to all worthy boys and men of the Church with various levels of power and responsibility, beginning at age 12. The Church of Jesus Christ of Latter-day Saints is the only Church which can trace its priesthood authority directly back to Jesus Christ. Holding and exercising the priesthood power is a serious matter; one which requires respect, reverence, and worthiness. The power of the priesthood brings the seal of authority to all Church ordinances. 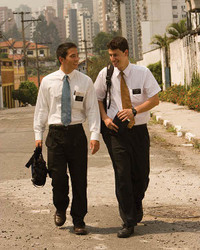 In addition to looking forward to the time when they will hold the priesthood, young men are strongly encouraged to serve two-year missions when they reach the age of 19. They may be sent anywhere in the world, dedicating those two years to sharing the gospel of Jesus Christ with others and helping to build the kingdom of God. Once young men reach the age of 19, they are eligible to put in their papers to serve a mission. A young man will meet with his bishop and stake president several times before actually going on a mission. The Church strongly encourages young men to serve missions because it can become a period of intense spiritual growth for each faithful missionary. It is also a wonderful opportunity to serve others with no thought of recompense. Young men who serve missions rely on their Savior and reach out to all of God’s children in love. For two years, missionaries devote their entire lives to the preaching of the gospel of Jesus Christ. For the most part, young men (or their families) support themselves to go out and participate in the wonderful work of sharing the gospel with others. Before leaving on a mission, young men go through the temple to receive their "endowments." Some time after their return, they are expected to marry. Marriage is part of the "new and everlasting covenant" of the gospel of Jesus Christ, and it is the most desirable state for all of God's children. The programs which are available to boys and young men can help them prepare to be better husbands and fathers, to be good and understanding leaders, as well as to be sensitive to others’ feelings and needs. With completing both the Faith in God and Duty to God awards, perhaps also an Eagle Scout award, and a mission, it may seem like it’s all work an no play, but it’s often more play than work. At least, by doing these programs, young men can discover that there is a deep joy and contentment to be found in hard work. The ultimate goal of all Church program is to have members reach their divine potential and to be happy. True joy is found in family and in relationships with others. This page was last edited on 27 March 2011, at 21:29.